Designed for the connoisseur like you. This is our second most popular mix assortment, which we create with a passion to offer you the best. We introduce to our clients an enticing range of Beads, which is extensively used to embellish the jewelery. These amethyst gemstone beads symbolizes royalty and provides an elegant look to the jewelery, enhancing the appearance of the wearer. 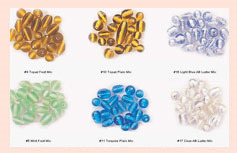 Our economically priced beads have attractive finish and long lasting sheen. These shapes are very helpful for jewelry project and many other purpose. We use these shapes to make fancy beads too. On your request we can make any shape in any colours. We strung beads too. Approx 2300 Pcs. in a 1 kilogram. Our range of Colored Beads includes silver foil glass beads, We are one of the leading manufacturer and exporter of beads which are available in various colors, shapes and sizes. Plastic beads in a different vibrant colors. Assorted beads can be used in jewelry making and other creative work also. D M Colors Made using high quality raw materials, these colors are available with various quality characteristics to the clients. we offer these beads for designing striking pieces of jeweleries. The varied range of blue are equally suited for making both contemporary and traditional jewelry. Funky and fantabulous designs of these assorted colored beads reflect our designers' inclination towards contemporary fashion. 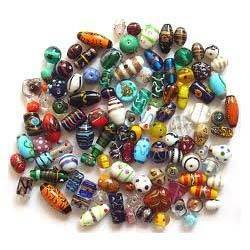 An exotic range of glass assorted beads, that is very much popular in USA/Canada & West Europe. So far this is our most popular mix beads assortment. Availability: In Stock Bracelet for Men from house of STRIPES . Fashionable piece of men bracelet made with Natural Lava Stone Beads which makes it unique and eye-catchy.Wear this beaded bracelet with any of your outfits for the dashing and handsome look. We offer you a wide range of Trendy Multi Colored Beads and which are perfect in finish and are available in various sizes and designs. These Beads are uniquely designed and visually appealing. A set of 100 small beads of various colours and shapes that can be used for a variety of purposes - beading, counting, sorting and playing games with the child based on your imagination. This toy can also be used for independent play. Plastic beads in a different vibrant colours. Assorted beads can be used in cycles for decoration.